Hotel Esplanade is a 3-star hotel in Cesenatico located right in the center and a couple of minutes walk from the beach. Ideal for children and families, it offers parking, garage, free WI-FI and air conditioning throughout the building. Admits animals of all sizes. 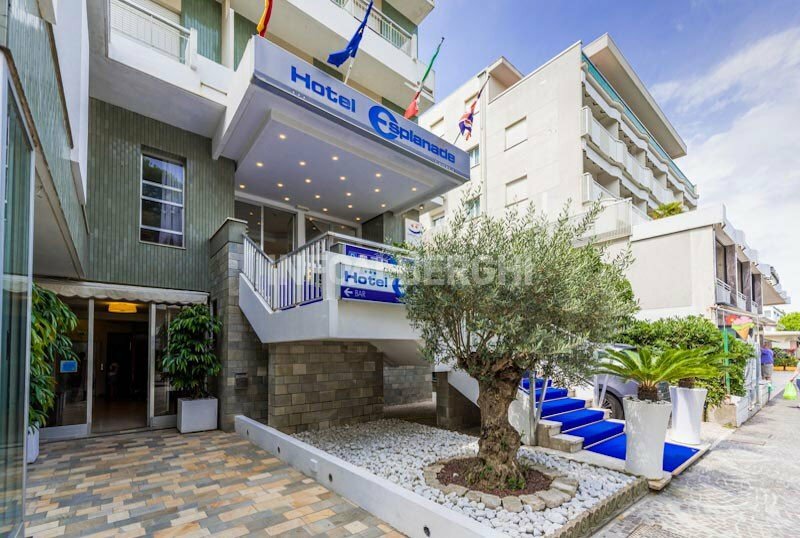 The hotel is located in the tourist center of Cesenatico, in a convenient position on the Via Carducci promenade, where shops, restaurants and shops alternate. The avenue leads to the suggestive Leonardo canal port in less than 10 minutes on foot. The beach is nearby and easily reachable in a couple of minutes on foot. All rooms have balcony (some with sea view), air conditioning, free WI-FI, digital terrestrial TV, safe, telephone, minibar without supplement, bathroom with hairdryer and shower. FAMILY : upon request, it is possible to stay in the comfortable Family Rooms, ideal for large families. Connecting rooms available. Terrace equipped with chairs and tables, free use of bicycles (also equipped with child seats), elevator, beach towel, daily consultation and laundry service on request. The staff organizes theme nights. PARKING : garage or parking in the outside courtyard for a fee and on reservation (limited places). CONVENTIONS : beach, amusement parks, swimming pool and waterslide. Shuttle service on request and organized excursions. PETS : pets of all sizes are allowed with a supplement of € 15 for the final hygiene treatment. Animal kit on request. LUNCH AND DINNER : every day, at the hotel restaurant "Il Tempio del Gusto", offers 3 buffet menus with dishes of local cuisine, pasta and homemade desserts, as well as drinks included (water, Pepsi, Fanta and Sangiovese, Trebbiano and sparkling Chardonnay wines). In the hotel : children's playground, baby sitter (on request), library, afternoon snack, mini club. Travel bag for children. In the room : cots without supplement, camping beds, beds with rails, night light, bath tub and bottle warmer. At meals : the restaurant offers flexible hours (children with meals eat half an hour before), baby seats at the table, baby menu, chicken and vegetable broth, cheese, pasta and homogenized. For those who want to discover Romagna, the hotel staff organizes excursions to discover the inland villages such as San Marino, Santarcangelo di Romagna and San Leo. In addition, weekly shuttles to the Cesena racecourse. Prices are per person per day full board, for a minimum stay of 6 days (they do not apply during special events). Every Thursday Pic-Nic at the Atlantica Water Park! At happydayshotel we take care of you and your next vacation! Book by April 30, 2019 and save up to 25% on your holiday. Book your stay in advance, for a minimum of 6 days in Full-All-Inclusive Pension! Book by April 30, 2019 and save up to 25% on your holiday. Book your stay in advance, for a minimum of 6 days in Full-All-Inclusive Pension! Free laundry service for babies. EASTER AT THE SEA IN CESENATICO! Come and celebrate Easter at the beach in Cesenatico! Rich Easter lunch and Easter Monday with traditional specialties of Romagna carefully prepared by our chefs! Do you want to guarantee the bib for the next 9 Hills?